Classical Jewish scholarship includes the study of the Bible and the Talmud – with their exegetical commentaries, corresponding legal Codes, rabbinical responsa, Halacha, Jewish philosophy and ethics. The rigorous curriculum is designed to develop students who will not only be dedicated to life-long learning, appreciation and understanding of the required texts, but will exemplify their commitment to the ethical and religious tenets of Judaism. By means of the curriculum, our institute seeks to motivate students to think independently; ask significant questions; investigate, analyze and weigh ideas; draw logical conclusions, and present sound arguments. The study of Torah and Talmud, with all its ramifications, is the guiding light for the observant Jew. Within the framework of the Jewish faith, the study of these sacred texts is the core of the Institute’s inter-disciplinary approach to academic investigation. A major focus of the academic program is the study of contemporary issues involved in the practical implementation of Halacha within the context of Canadian society. The Institute trains students in the application of critical and analytical thought to action, and prepares them to assume positions as highly knowledgeable and committed rabbinical or lay leaders. IAJS places the study of the Talmud at the core of its curriculum. The Talmud is the key to all classical Jewish studies as well as the most challenging part of these studies. It contains a vast body of information about Jewish law, history, commerce, philosophy and ethics. The Talmud is made up of two components: the Mishna and the Gemara. The Mishna is case law presented in concise Hebrew. The Gemara, written mostly in Aramaic, is the dialectical analysis of the Mishna, with excursions into legal, ritual, grammatical and philosophical areas of inquiry. The Talmudic dialectic, as embodied in the Gemara, may be compared to an inquiry in pure science. The ultimate purpose is to seek out the truth underlying a given text or concept. Therefore, equal weight is attached to both theoretical and practical matters. The Talmudic dialectic takes nothing for granted within the context in which it works. It is only satisfied once an analysis or proof approaches absolute certainty. One has to prove a matter conclusively, point by point. The entire structure is not acceptable until each step has been shown to be sound. The axioms of this dialectic or logic are the variety of facts and issues as presented in the Bible and Mishna. The rules of inference are a carefully selected set of hermeneutic principles (such as the 13 principles of the 2nd -century Rabbi Yishmael) for deriving new facts, deducing theories (svoras) or arranging the facts into a coherent whole (sugyas). It takes many years of intensive study, not only to master the Talmudic dialectic, but also – and more important – to apply it to daily life. The vast body of post-Talmudic literature elucidates the more difficult and complex Talmudic passages and concepts. It also organizes and codifies applicable laws, and derives frameworks for solutions to future Halachic issues. Thus, to gain proficiency in reading the Talmudic text, students have to acquire comprehension of the issues elucidated in each folio, and develop the ability to analyze textual material. These goals are realized through mastery of the major classical commentators (Rishonim), such as Rashi, Tosafos, Ramban, Rashba, and Ritva as well as the major codifiers; for example, the Rif, Rambam (Maimonides) and Rosh. IAJS faculty have published many research items through many volumes of the Hamaayan Research Publications, a bi-annual magazine. Individual faculty members have also published in a variety of scholarly monographs and halachic texts aimed at the general population. The Institute’s main campus building is located at 515 Coldstream Avenue in Toronto. The building houses classrooms, three book libraries, CD library, two computer online libraries, the Bar Ilan computer resource library, the Kol Halashon online Lecture library containing over 50,000 lectures, meeting rooms for student-teacher conferences, a kitchen and a dining room. By far, the most impressive area of the main building is its 3,000-square-foot Bais Medrash. The Bais Medrash serves as the focal point of the Institute’s academic activities. It is filled daily with full – and part-time students, and provides a setting conducive to the IAJS system of study. Within this hall, students labor over the various Talmudic tractates and other texts, and toil at understanding them and applying them in the modern context. [school of Talmudic study] education. This one-on-one give-and-take results in a learning experience that is not only enjoyable but also hones the students’ analytical skills. The Talmud itself praises study in “chavrusa” (pairs or groups) for the obvious advantages that accrue through animated discussion, crystallization, debate and defense of concepts that would otherwise remain vague and nebulous ideas that defy expression in clear language and precise formulas. Chavrusa time is supervised by a senior lecturer whom the students can call upon for help in deciphering complex passages. Once each student has prepared the basic text with a peer (chavrusa), the students attend a lecture given by a member of the rabbinical faculty. This lecture is called a shiur. The shiur is an interactive experience delivered in a dialectic fashion. Questions are raised and solutions are put forward, often leading to lengthy debates that may not be resolved for days. Each shiur is given in a classroom or in the main Bais Medrash. 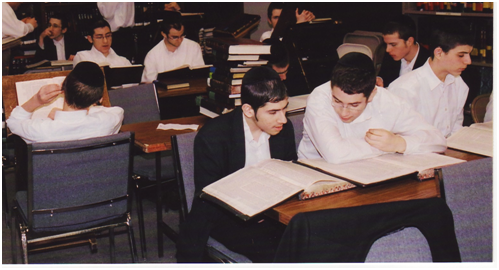 As in many post-secondary institutes of traditional Jewish learning, an important part of the teaching at IAJS is the “Chabura” system, an arrangement that finds groups of students pursuing the text on a common level and pace, according to their background and level of sophistication in Talmudic research. Students take turns at presenting their findings in a seminar and defending their material in the group. Each Chabura focuses on a specific area of study, maintaining its own pace and regimen under the leadership of its Rosh Chabura (Chabura leader). The IAJS provides opportunities to study virtually any area of the Talmud in the intellectually charged atmosphere created by the IAJS community of scholars. A copy of the IAJS academic calendar is available by contacting the Dean of Students during school hours.